Use the VEX Power Expander to add a secondary power source for four of the PWM outputs on the VEX ARM® Cortex®-based Microcontroller. Balance a robot's motor load across two batteries to extend robot run time and increase performance. The VEX Power Expander is used for adding a secondary power source to power up to 4 VEX 2-Wire Motor 393s or VEX Servos. 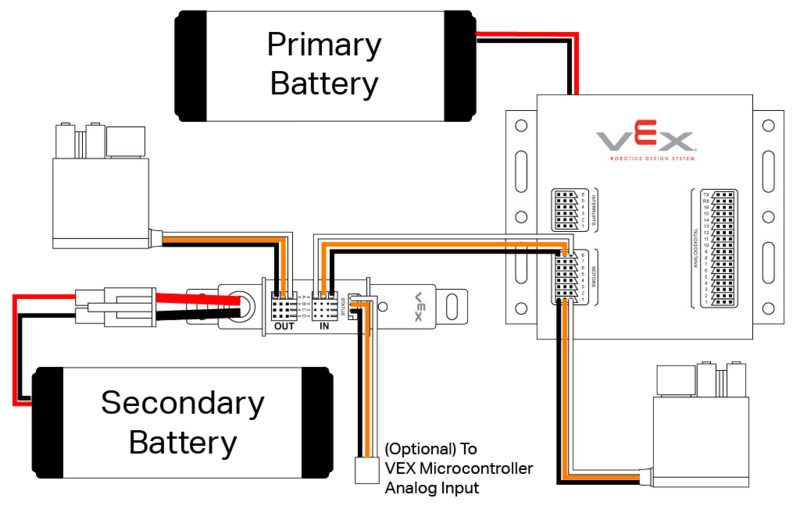 The Power Expander enables the user to spread a VEX robot's motor load across two batteries, extending run time and increasing performance. Mount the VEX Power Expander securely to the robot using standard VEX hardware (not included). Provide power to the unit by connecting a 7.2v VEX Battery Pack, or a 7.2v VEX Battery Holder to the power connector. The Power Expander LED should flash green briefly signaling power is being supplied to it. Connect VEX PWM Cables from the Microcontroller Motor Ports to the “In” port of the Power Expander. The Input Ports (A-D) connect to any four of the Motor Ports (#1-8) of the VEX Microcontroller. In the picture, Microcontroller Motor Port 5 is connected to VEX Power Expander Input Port A. The Transmitter channel that controls the Microcontroller Motor Port 5 will now control the Power Expander Motor Output A. Note: A "Keyed" connector and will only insert in one (correct) orientation. When using Non-Keyed PWM Cables on the VEX Power Expander, the Gnd/Blk wire should be closest to the key slot on the STATUS and IN Ports, and it should be the furthest from the key slot on the OUT ports. Connect VEX Continuous Rotation Motors or VEX Servos to the corresponding “Out” ports of the Power Expander. Slide the Power Expander PWM Lock to secure cables. Turn on your Microcontroller. The feedback LED should now show the status of the Power Expander and motors/servos should respond normally based on the secondary battery power. The VEX Power Expander includes a Status port that can be connected to an Analog input on the VEX Microcontroller. This can be used to determine the approximate remaining voltage of the battery connected to it. To determine this value, divide the Power Expander read-out by the divisors shown below. The examples are for a 10-bit result (maximum value of 1023). If using a compiler with 12-bit resolution (max value of 4095), multiply the analog values and divisors by 4. PIC Example: Use a divisor of 70.8. The PIC analog value is 460. 6.5v is the current voltage of your Power Expander battery. Cortex Example: Use a divisor of 45.6. The Cortex analog value is 297. PIC Example: Use a divisor of 155. The PIC analog value is 930. 6.0v is the current voltage of your Power Expander battery. Cortex Example: Use a divisor of 70. The Cortex analog value is 455. Due to loading of the Cortex analog circuit, the Power Expander LED will blink red even though the battery is good and the internal circuit breaker is not tripped. 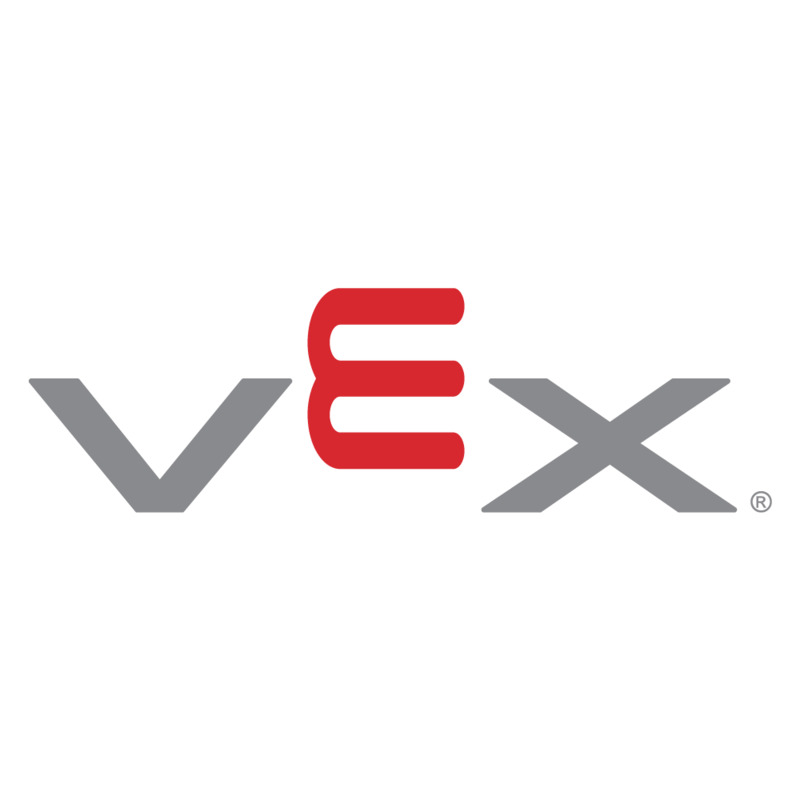 VEX Robotics can update Rev A and Rev A1 Power Expanders to Rev A2. This will restore normal LED response. If the value drops below 4.8v, the internal Circuit Breaker may have tripped. The VEX Power Expander also incorporates an internal circuit breaker to prevent damage to the unit or connected devices. The onboard LED provides its current status. Refer to the following LED status chart for more information.